Spooner’s is named after the commissioning engineer of the original Ffestiniog Railway James Spooner, who built in the line between 1832 and 1836. 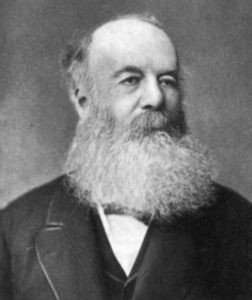 He was succeeded by his son Charles Easton Spooner who continued the engineering dynasty until the end of the nineteenth century. James’s skill had been to construct the line, whilst Charles was an engineering genius. In the Ffestiniog Railway he created the blueprint for narrow gauge railways around the world – the railways of Empire. This was at a time when Parliament was trying to decide on a standard gauge for Britain’s national network: Stephenson’s 4’8½” or Brunel’s 7’¼” the Ffestiniogs’ 2’ gauge must have seemed ridiculous. However, it more than proved itself as is evident by the number of narrow gauge railways that were built across the world. Some of Charles’s engineering genius can be seen adorning the walls around Spooner’s in the form of his contemporary drawings and photographs, including one of the man himself. Part of the premises is the stations’ original goods’ shed. Look carefully at the two large windows which open onto the terrace and imagine the tracks coming inside and wagons of goods being unloaded for horse transport around the town. Today, access through these windows is on to our outside terrace. Situated between the two platforms you can sit here and enjoy watching the trains come and go. If that’s not your idea of relaxation then look beyond the tracks to the outstanding sea view that is the confluence of the Glaslyn and Dwyryd Estuaries with the mountains of Snowdonia beyond. Spooner’s – something for everyone!